Recently, we discovered a bit of a problem with the recording of high-speed radar data at KAIRA. We have had some problems with the recording of UDP packets via our local data computer kaira01. As part of the testing for the installation of the new QNAP data recorders, we were also testing the UDP packet reception on not just the QNAP box, but also one of the other KAIRA acquisition machines, kaira03. 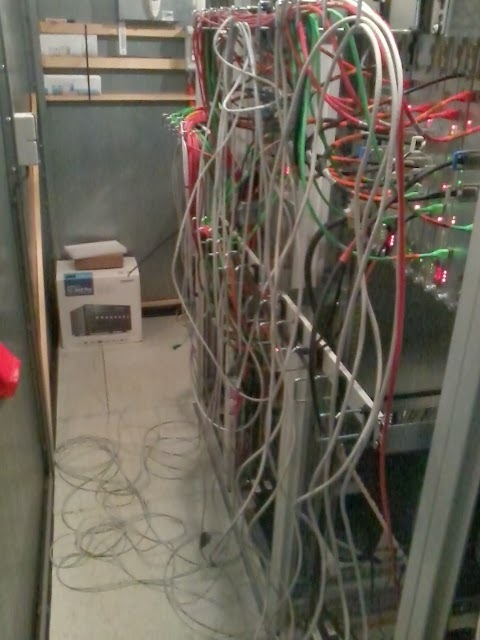 As this work was being done in the RF-container, we were physically in the container and running the software from there. During this time, we noticed that simultaneous dropped packets on all four lanes would occur at precisely the moment that the air-conditioning cuts in. Suspecting possible power spikes somehow getting into the network we traced the cables. These turned out to be quite long (two were 7.5 m and the other two were 10 m) and surplus length was coiled in the sub-floor space under the racks close to some of the power distribution cables. We therefore suspect that some packet loss might have been caused by spikes induced into these cables corresponding to power fluctuations. At the time we were checking this, we also noticed that the cables used were CAT-5, which are only rated to 100 Mbit/s. We have now replaced all four cables with 3-m CAT-6 cables (rated to 1 Gbit/s). These cables route directly through the signal cable guides on the back of the racks and do not go anywhere near the sub-floor space. We now see a noticeable improvement in packet reliability, although we still see the occasional lost packet.